Despite what the name might suggest, this isn't one of those creamy, white lotions to moisturize skin after a bath. The SK-II Facial Treatment Clear Lotion is a water-like liquid that works as a very gentle exfoliator, and with ingredients like lactic and salicylic acid, it helps skin look fresher and healthier over time. As with all products in the SK-II line, this lotion also contains Pitera that enhances skin' surface rejuvenation properties. To use the lotion, I pour a few drops of this lotion on to a cotton pad, and I use it to wipe my face and neck (use on clean, dry skin). While it primarily works as an alcohol-free exfoliating toner, it also removes any residue left behind after cleansing. As for results, it has made my skin look healthier and clearer over time. I do think this might be an effective product for oily or combination skin types and am unsure if it would make much of a difference for someone with dry skin (who might benefit from something more hydrating). This lotion contains AHAs and can cause increased skin sensitivity and make skin more prone to sun damage, so don't forget the sunblock while using this. 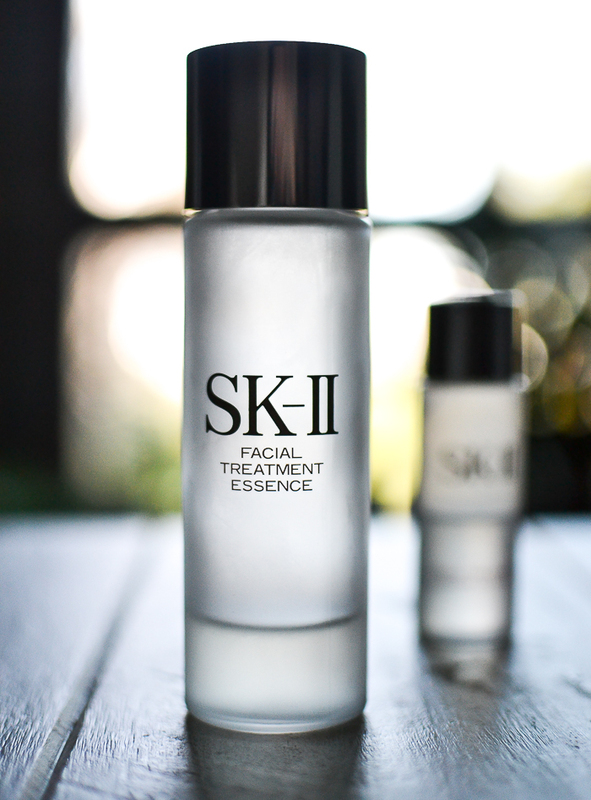 Moving on to the next step in my skincare routine - SK-II Facial Treatment Essence. If you went up to an SK-II counter, chances are this would be the first product recommended for you to try out. The reason for this is quite simple. The core ingredient in the SK-II skincare range is a yeast-derived, vitamin and organic acid rich ingredient termed Pitera, and the SKII Facial Treatment Essence is brimming with more than 90% of Pitera in each bottle. SK-II claims Pitera works by enhancing the natural renewal and rejuvenation properties of the skin, and it is also believed to be similar to skin's Natural Moisturizing Factors that help increase skin translucency, smoothness, and softness. 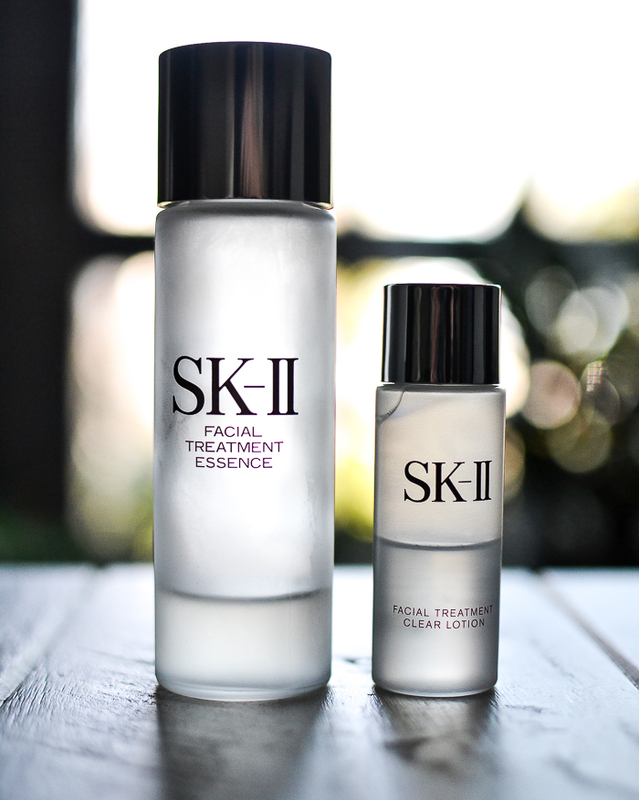 The SK-II Facial Treatment Essence - The Treatment Essence itself is a clear, water-like liquid. I must have some kind of noseblindness because I don't really notice much of a smell to this Essence - a slightly old smell is all I can get if I try and try - but I have read enough reviews online to know there is a weird smell to it, and if you have a sensitive nose you might want to give this a sniff test first. I use SK-II Facial Treatment Essence after the SK-II Facial Treatment Clear Lotion (or any other lotion/toner that I might be using) and before a serum. There are two ways to apply this Essence. The easiest (and perhaps more economical) method is to pour a couple of drops of the essence on to the palm of your hand, rub to spread it between palms. and smooth on the face. Then, use patting-tapping motion to help the essence soak into the skin. Method #2, saturate a cotton pad with the essence and use that to pat the essence into the skin. Going by my personal experience, I do feel the cotton-soaking method leaves skin looking fresher than the patting-with-palms method, but it's not a very drastic difference, and the cotton does soak up quite a bit of the product. Irrespective of the method used, the essence gives my skin a plumped, hydrated look, and over time, my skin looks brighter (lighter marks, not lighter skin) and clearer. On days when my skin is feeling a bit sensitive - like after a bit of exfoliation - the essence does cause some very slight slight redness/burning. Something to keep in mind if you have sensitive skin or skin that tends to get irritated very quickly. The SK-II Facial Treatment Clear Lotion and the SK-II Facial Treatment Essence have been a good addition to my skincare routine, but it might only work for you if your skin type is similar to mine. I have oily-combination skin, oily T-zone (mostly nose), occasional breakouts and sometimes dry patches near my cheeks. I also get fine lines on my forehead when my skin is dehydrated. What works for my skin is lots of moisture and regular gentle exfoliation. Wrinkles and sagging are not a concern currently - I am more bothered about having healthy skin. 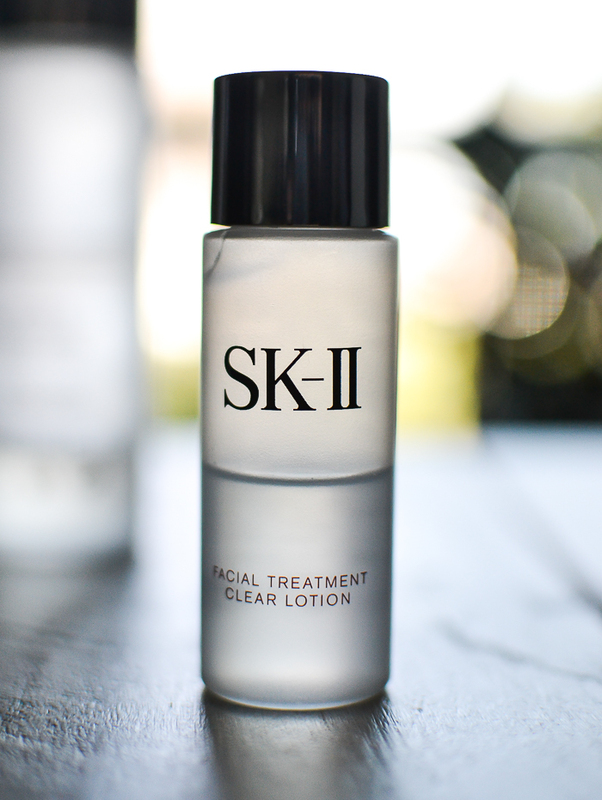 If this sounds similar to your skincare concerns, the SK-II Facial Treatment Clear Lotion and Facial Treatment Essence might work for you too. The Clear Lotion removes build up of dead cells from the surface of the skin and brightens dull skin. As the next step, the SK-II Facial Treatment Essence softens skin and help serums and moisturizers absorb better. Together these two products have made my skin look clearer, brighter, and overall really healthy. I definitely would have to agree with the SK-II theory about increased skin translucency and smoothness, at least going by my experience. I still have scars and marks from old acne, but these are a lot less noticeable. 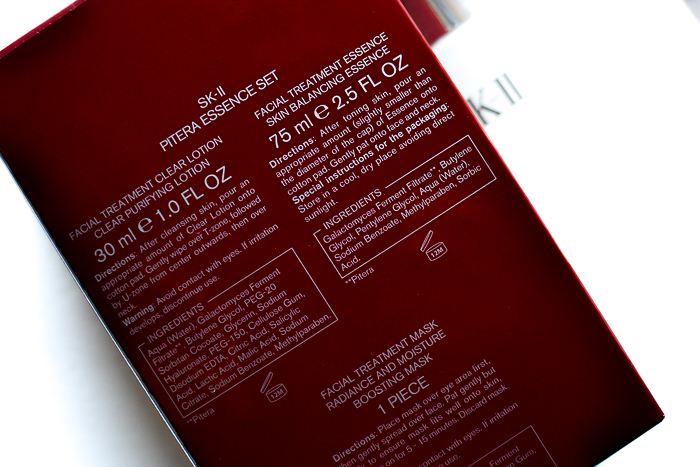 I got the SK-II Facial Treatment Clear Lotion and Treatment Essence as part of the Pitera Essence Set ($99). Smaller sizes are also available in the SK-II Pitera Starter Kit ($69). Both of these are good ways to try out these products without buying expensive full-size bottles. Personally, I knew the Facial Treatment Essence would work for me because I love the Facial Treatment Mask (which contains a concentrated version of the Essence), and if you are looking for a relatively inexpensive product to try out from the SK-II line, a single-use mask would be the best option. Great review Radhika. Do u recommend these for dehydrated skin? I have oil/ combo skin which is extremely dehydrated, I am especially worried of salicylic acid in it! Try the Facial Treatment Essence, Eesha. The Lotion I amnt too sure about, though I do feel if you have acne-prone skin and you use it in combination with hydrating products (serum, moisturizer etc) it might be helpful.. or you can use it on an every-other-day basis.